With the relentless advance of technology, the sound level meters of today are very different creatures to those of the Sixties. This blog post looks at the evolution of sound level meters, delving into history and looking at the trends that are shaping their future. We will look at some of the technological developments and factors that have changed the industry. To illustrate how far sound level meters have come let’s start in Times Square, New York, in the twenties. A Fox Movietone News Story shows a technician from the Noise Abatement Commission making noise level measurements in different parts of the city in response to a rise in traffic. Armed with a receiver, a microphone, a phonograph and a wobbling test tone to measure “deafness produced by noise”, he concluded that “the noise in Times Square deprives us of 42% of our hearing” [sic]. It would be 30 odd years until the first sound level meter standard is introduced, shortly followed by standards and regulations describing its usage. With the emergence of the first sound level meter standard, IEC 123, sound level meters had to be designed according to certain criteria to be approved and accredited. The standard was published in 1961 and with it began the era of commercially available sound level meters. But sound level meters back then looked very different from those of today. Turn the clock back 50 years and we start to see what we would recognize today as a sound level meter. Before this time, noise measurements were performed with heavy equipment based on valve technology. The engineer would have to transport his heavy equipment to the site, set up input and output attenuators before beginning the measurement. Once the measurement was in progress, with no internal memory, levels would be recorded on a level recorder, the engineer marking events on the paper roll. Post-processing software was non-existent and there were no alternative ways of displaying results. Brüel & Kjær’s Precision Sound Level Meter Type 2203 launched in 1962 was, thanks to transistors, much smaller than its predecessors. Weighing in at just 5 kg with an octave filter set attached, Type 2203 was arguably the first portable sound measurement device (although the level recorder was another 25 kg). However, transistor technology back then was not a precise science and not without its issues. Transistor batches had to be sorted at the factory according to their quality before using them in production, so great was the variation in resistance. Viewed today, where everyday life is filled with smart miniature technology, Type 2203 doesn’t seem particularly small or light, but considering the technology available, it was impressive at the time. Fast-forward to the Eighties and the end of the era of big sound level meters. Driving this process was the emergence of microprocessors. Microprocessors offered increased processing power due to integrated circuits that combined multiple transistors onto one chip, making parallel measurement of up to five independent parameters possible. The first Brüel & Kjær sound level meter to integrate a microprocessor was Modular Precision Sound Level Meter Type 2231. The choice of microprocessor was the cost-effective RCA 1802 – undoubtedly a good choice as it was also used in NASA’s space programmes at the time. In parallel to the development of microprocessors came internal memory (or built-in data storage) that allowed users to save their data on the sound level meter itself. This was around the time of the first electronic spreadsheets from VisiCalc, later Lotus Notes and Microsoft® Excel® – the usage of personal computers to make calculations was becoming more widespread. By the late Eighties and early Nineties, the digital revolution was accelerating at a remarkable pace and would have a huge impact on the future of sound level meters. The Nineties saw the growth of digital signal processing, which, combined with greater computing power made it possible to process more data in real time. For example, measuring a 1/3-octave spectrum on sound level meters with analogue filter sets involved measuring each frequency band individually, one after the other – a time consuming process! With digital signal processing, real-time 1/3-octave band frequency analysis became a possibility, measuring all frequency bands simultaneously. 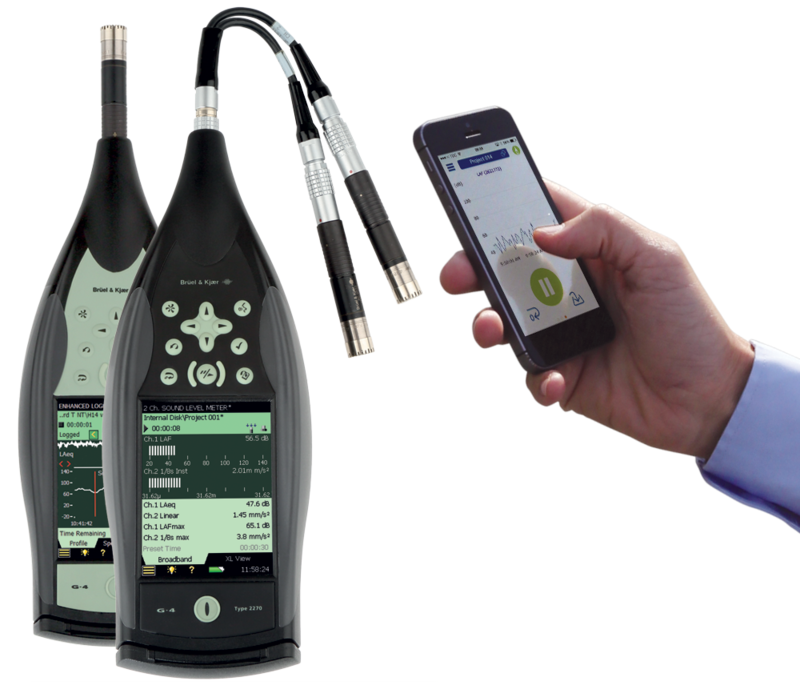 As digital signal processing became widespread among sound level meter providers, more detailed analyses like FFT would become possible in a handheld platform. The first Brüel & Kjær sound level meter to adopt this new technology was Type 2260, released in 1994. Aside from large colour displays and advanced post-processing; connectivity is a central feature of 21st century sound level meters. First released in 2004, Brüel & Kjær’s Hand-held Analyzer Type 2250 shared many features with its technological cousin, the personal digital assistant (PDA). A colour and touch-sensitive display was a leap forward in usability, while USB and Ethernet interfaces offered flexible and convenient methods for connecting to a PC – be it in the same room, or on the other side of the world. Today, sound level meters Type 2250 and 2270 can even connect wirelessly to Wi-Fi networks, making remote control from a smartphone possible, along with cloud-based services for data storage and sharing. Today, smartphones are a constant presence in most of our lives. These pocket-sized devices are much more than just phones – they are wireless communication devices combining microphones, cameras, speakers, accelerometers, gyroscopes and high-resolution touchscreens, with processing power rivaling the desktop computers of just a few years ago. They connect with an ever-growing range of devices and sensors, from heart rate monitors and pedometers, to seismographs and even sound level meters like Type 2250. It is unlikely that sound level meters will ever match the computing power and flexibility of contemporaneous smartphones, but if history has taught us anything, we can expect smart devices to influence sound level meter design in the future. The display, computing and wireless technologies developed for smartphones will increasingly be integrated into sound level meters, and the use of smartphones connected to sound level meters will also increase. We’ve come quite a long way since the dapper measurement technician of Times Square in 1929, jotting down numbers in a notebook and working out hearing deprivation percentages, but environmental noise measurements are more important than ever.